A play based on “Sophie’s Log” was commissioned in 2001 after encouragement from Professor Richard Demarco, a very influential person on the Edinburgh arts scene. The playwright is Bryan Willis from Seattle. There is a very small cast; Sophie, aged 19, and Sophie as a much younger person. 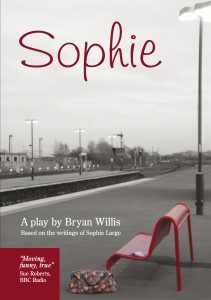 The play called ‘Sophie’ received its premiere at the 2002 Edinburgh Festival. The Scotsman newspaper gave the play a four star rating and the recommendation that the play was a “definite must see”. It played to full houses. The play then toured the USA. This was master-minded by Erin Hurme (one of our ex-sponsored students). The play was then commissioned by the BBC as a radio play and broadcast on BBC Radio Four (The Afternoon Play) in April 2004. The most recent performance took place in Sophie’s Barn in March 2012. It was performed by students from Washington State University USA under the tutorage of the playwright Brian Willis. It was to commemorate the 10 years since our trip to Edinburgh. The play remains as fresh, compelling and relevant as ever. To order a copy of the stage play, send an e-mail to office@sslf.org.uk. Supporters from the USA can order direct from Bryan Willis, willis@sslf.org.uk. The play costs GBP £7.00 or US $9.00 plus postage and packing. To enquire for rights to perform the play, send an email to office@sslf.org.uk. An extract from the play is also currently on the LAMDA Acting Exam Syllabus.